I mentioned in a previous post that I was going to write up how I originally got involved in RPGs. This is going to be that post so if you’re not interested in biographical information on about me, you can probably just skip this one. 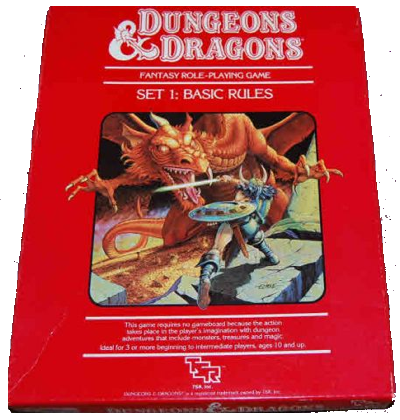 As many of us that started gaming back in the early days of the hobby, I was first introduced to RPGs via Dungeons and Dragons. In my case it was the Red Box Basic Set (I’m not old enough for an earlier edition ). And like many, I played my first games at school, sixth grade to be exact. However, in my case, it wasn’t at lunch or hanging out with friends after school was out. It was actually in class and part of the curriculum (well, sort of). The year was 1983. I was living in Fort Rucker, Alabama where my dad was an air traffic control instructor for the US Army. Being one of the “smart kids” I was enrolled in the school’s Gifted and Talented program. Practically, this mean that one day a week (I think it was Wednesdays), those of us in the GT program would go with a different teacher to a separate classroom and work on various different or advanced curriculum topics. I remember having a beehive in the classroom (it opened up outside and we got to eat the honey at the end of the year), dissecting an octopus, and a number of other things 5th and 6th graders don’t typically do in an average classroom. My 6th grade year, one of the other students introduced this role-playing game to the teacher and made a pitch for running those of us in the class on an adventure. Apparently he made a good case because the teacher agreed. Over the course of the next few weeks, an hour or two of each class was spent with our desks in a circle, a character sheet in front of each person, and dice being passed back and forth to make rolls. I honestly don’t remember anything about what adventure we went on, if the other student made it up or ran a pre-published module. I do know it wasn’t B2 Keep on the Borderlands that came with the boxed set because when I got my copy, I did not recognize the adventure we played. There were only about 6-8 students in the class so the group size wasn’t too big and I don’t remember if the teacher played or if she just watched. I do remember having a lot of fun and thinking that it was something I could really get into. My 12th birthday came just shortly after we finished playing at school. I had a birthday party and the guy that ran the game at school gave me a copy of the red box as a birthday present. I devoured the rules and then rolled up characters with two of my younger siblings (I’m the oldest in the family) who would have been 8 and 6 at the time and we started adventuring. Of course this was right at the height of the so called “Satanic Panic” in the RPG world and my parents were a little skeptical. They didn’t have a problem with the concept of role-playing games per se, but with all the hoopla surrounding D&D at the time, they were a little leery of it. So it wasn’t a “Thou shalt not play role-playing games!” It was more like “Maybe you should play something else.” So we made a deal (offered by my parents): stop playing D&D and give them the rule books (I could keep the dice) and they would buy me a different game. Well, I’ve always been more partial to science fiction than fantasy anyway and I had been eyeing this sci-fi game at the Post Exchange (PX) on base. For those unfamiliar with military bases, that’s the on-base department store. And yes, they carried RPGs on base. It was called Star Frontiers and was made by the same company that made D&D. So I handed over by Basic Set and my parents bought me Star Frontiers. And if you’ve been paying attention, I’ve never really looked back. I’ve played a few other games over the years although I never really ever went back to D&D. Beyond the game at school and the ones I ran with my brothers, the only other time I ever played was a few sessions of 2e in grad school in the late nineties. I own and have read the 2e Player’s Handbook and Dungeon Master’s Guide but have never ran them. That’s how I got started in the hobby. How about you? Feel free to share your story or comment on mine below.